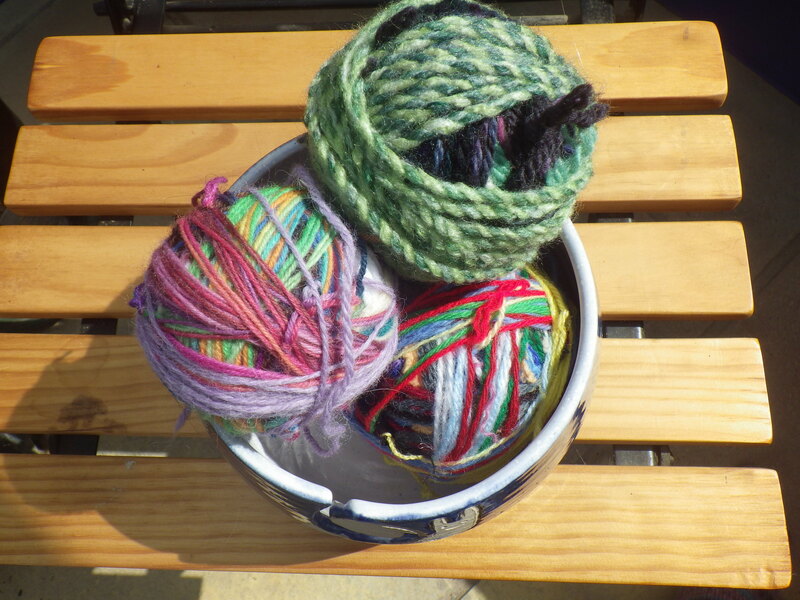 Mr Snail and I spent a productive hour last night tying yarn scraps together and winding them into balls because, it turns out, I did have some more. I simply needed to look in a few more drawers to turn up several bags of yarn ends, collected to use for stuffing. The result is enough reconstituted yarn to make two or three more hats. This is good, because I’d sold the last one in less than 24 hours and I would like one to take to the International Permaculture Convergence (especially since several other people also expressed an interest in buying the last one). Anyway, I now have two gauges of yarn to work with and more surprising hats to come! 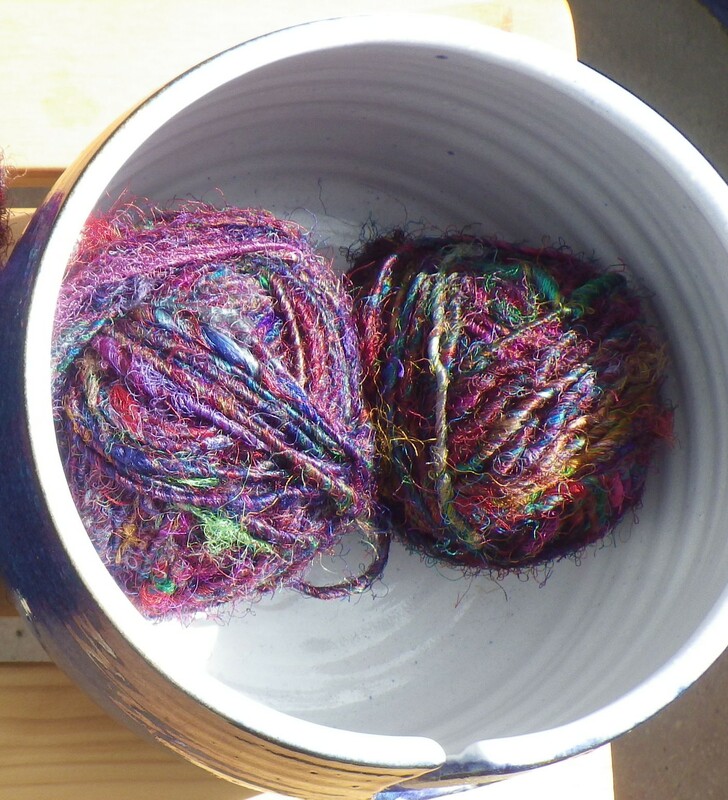 I’m not alone, however, in using scraps to create new and interesting yarn. As I wound my ball, I remembered the recycled sari silk yarn that I had tucked away. I’ve had this lovely yarn for ages. Mine is from a company called Mango Moon, and they describe it as follows: Gorgeous, glowing jewel-toned recycled silk, handspun in Nepal. Your purchase helps the Nepalese women who spin this beautiful yarn provide safe shelter, education, and health care for themselves and their children. No two skeins are alike. It is made from remnants of silk from weaving mills and from old silk saris. These are shredded and re-spun by hand. I really don’t think that the photos do its jewel-bright colours justice. Anyway, I’ve decided to share the loveliness and make some hats from this yarn too, thus helping to support the ladies who produce this gorgeousness. Oh my word, the colors are fantastic!!!! What a wonderful thing to do. I’m so excited to see the outcome. I’m not posting a picture of the finished hat until I’ve made a second one… that way if one gets snapped up straight away at least I’ll have a back-up!! Oooooh! Gorgeousness!! I’m visiting your link immediately! Also, I am not at all surprised the hat got snapped up – well done you, it’s a winner! I’ve nearly finished a second one now – trying to make a variety of sizes so that there is something for everyone! It is glorious… a bit of a pain to work with though because of the variation in thickness… still, Ideal for your weather as it’s very toasty to wear. I would have thought that silk would be cool/cold? This chunky stuff is very toasty! What a pity my climate is not conducive to hat wearing, because that sari-yarn is just fabulous…. Sadly, it is REALLY warm to wear! I suspected as much…. but they’re so beautiful you’ll have plenty of other takers! Wow. amazing colors. can’t wait to see the next hats! a real feel good post! Those colors just make me so happy! Thanks for sharing!!! Amazing! I’m so impressed by your resourcefulness, and I’m now seeing the bag of yarn scraps I keep as a potential new pair of mittens! The sari yarn is beautiful too. Happy knitting! I had really only thought of it in terms of stuffing until a couple of weeks ago, but it just needed a bit of lateral thinking and suddenly there was new hat! What a fun project! I can’t wait to see the next hat.